The MBA program at the University of North Alabama allows you an opportunity to earn your MBA from a nationally ranked program. 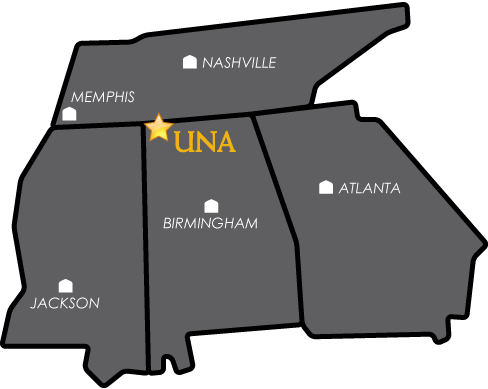 UNA offers the M.A. in Education, Alternative A program, Education Specialist degree, M.A. in Clinical Mental Health Counseling, and M.S in Health and Human Performance. The University of North Alabama offers courses of graduate study leading to degrees and/or professional certifications so our students may increase their knowledge, further their careers, and succeed in their fields. Eligible students who do not wish to pursue a course of study may use individual graduate courses to serve other professional, vocational, or personal interests. Graduate degrees are offered in various programs and concentrations. The programs of graduate studies are offered by the University through its College of Arts and Sciences, College of Business, College of Education and Human Sciences, and the Anderson College of Nursing. Explore Graduate Programs. Students who wish to enroll in graduate studies must be admitted officially to graduate studies on formal application. Consideration for graduate studies is based on qualifications as outlined in the graduate catalog. Each graduate program has specific admission requirements. See Admission Requirements. Visit our Getting Started page for a step-by-step guide through the application process for the University of North Alabama graduate studies program. Are you ready to get started on your graduate application? Apply to UNA! Graduate school is an investment, and UNA offers Assistantships and Financial Services to support your venture. Learn more. Did you know? UNA Testing Services offers some of these exams on campus! Visit the Testing Services page to learn more about upcoming testing dates.